Over the past couple of weeks here at the Ronin Round Table, we’ve been giving a look at some of the hard work and creativity it takes to successfully make and market an RPG based off someone else’s IP. For those who may not know me, I’m the developer for the Song of Ice and Fire Roleplaying line, another of our games set in a licensed setting: in this case, the world of George R.R. Martin’s A Song of Ice and Fire series. A Song of Ice and Fire is, in many ways, perfect for a game universe. It is sprawling, both in terms of actual geography, but also in its politics, its cultures, its history and its opportunities for bravery. Individual heroes can and do make a difference here, on every scale you care to look at the setting, and that’s a recipe for great gaming. Probably the trickiest part of this whole creation process is what I like to call “dancing with canon.” Every setting has a canon of some kind, that body of lore that reflects what has decisively happened in the setting. As time goes on, these settings develop fan-bases who know this material as well as they know real-world history (better, for some of us). This is a good thing, generally: capturing the imagination of those who partake in the setting’s media to such an extent that they seek out and remember elements of history, small traditions and cultural nuances, interrelationships between characters and all the other aspects of a setting so clearly make that setting feel real, to some degree. This provides immersion for that fan, who becomes even more invested in the setting. Working with A Song of Ice and Fire requires, on some level, being one hell of a dancer. There is plenty of wonderful canon to be absorbed and interacted with. In fact, when it seems like there’s possibly “too much” for any one person to keep track of, we are fortunate to have wonderful resources like the Wiki of Ice and Fire, for instance, a place where a dedicated core of fans have taken it upon themselves to make a record of the setting: an incredible boon not just for those of us who create the RPG, but for those who run and play it. Of course, one of the difficult places in interacting with such a complicated and nuanced canon lies not in what has been said, but what explicitly hasn’t. Certainly, there are always aspects we haven’t seen, just because they haven’t shown up in the narrative: the “words” of some of the Houses of Westeros, for example, or full geographical details of the continent of Essos. The other sort, though, are the setting’s mysteries, things left unsaid because there will be a time and a place, important to the narrative, to speak of them. They are often the keys to major plot-lines and characters. 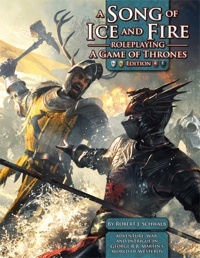 A Song of Ice and Fire has plenty of these sorts, covering historical events, character backgrounds, unrevealed motivations and allegiances and even the metaphysics of the setting itself, such as how various forms of magic work, how magic influences the land itself and the creatures that can be found in it. Though I’ve been a developer for other game lines before, those elements were often left to my discretion as the developer. I’m sharpening a whole new set of skills here: walking the gauntlet of settings with active mysteries in them whose solving is not up to me. In an effort to provide the maximum utility for our players, our preference is to skirt those sorts of issues when we can. To do so often means focusing on the elements that come directly into game play while avoiding the origins or implications thereof. As an example, with the publishing of A Dance with Dragons, we learned more about the “warging” ability some characters in the series have, to greater or lesser degrees. We have since updated aspects of our rules set to better reflect those narrative revelations (in the forthcoming Song of Ice and Fire Roleplaying, Game of Thrones Edition). While sharpening how they mechanically impact the game, we have tried to remain as hands-off as possible when it comes to the implications of some of those revelations, particularly with regard to the background involving the Children of the Forest, how those powers interact with other seemingly supernatural abilities in the setting, and the like. For a lot of our setting work, we try and focus on “filling in the blank spaces.” There are many areas of the world that are still described in broad strokes, without much detail. Such areas provide some creative playground for our design work. As we did for the Chronicle Starter, if we decide to create a few new minor Houses, we have a good idea of how such Houses work, in the various realms of Westeros. As such, we can fill in some blanks, making assumptions that provide us just enough of a frame-work to construct something that is useful to our game’s narratives without necessarily strong-arming an already-existing House into that role. Of course, part of the allure of playing in this setting is the fact that the Narrator is under no such restrictions. We as game designers and publishers may carefully skirt areas of uncertainty, the individual stories told at the gaming table by the group playing this game can go in any sort of directions its players are interested in taking it, which is one of the major appeals of playing in this or any licensed world. In the end, though, this process is more fun than it is work. As a fan of Mr. Martin’s setting and writing since I picked up A Game of Thrones a double-handful of years ago, the opportunity to help bring that world to other gamers is a delightful challenge, one which those who created our Song of Ice and Fire Roleplaying system rose to capably. I look forward to plenty of chances to do the same.